MANKAR® ULV spray systems were originally developed for the undiluted application of glyphosate (e.g. Roundup® products). However, the units are suitable for use with most liquid herbicides. The advantages of MANKAR® ULV spray systems can be used particularly with foliar herbicides, especially where the protection of cultivated plants against damage from herbicide contact is essential. In practice, the units are still widely used with glyphosate. In addition, there are numerous other herbicides applied with MANKAR® ULV spray units, such as those with the active substances glufosinate (e.g. Basta®) and mixtures of 2,4-D, Mecoprop-P, MCPA and Dicamba (e.g. Banvel® M). Several biological herbicides can also be used. In the summer of 2007, a test was conducted using a combination of glyphosate (Roundup® UltraMax) and soil-applied herbicides in Christmas tree nurseries. 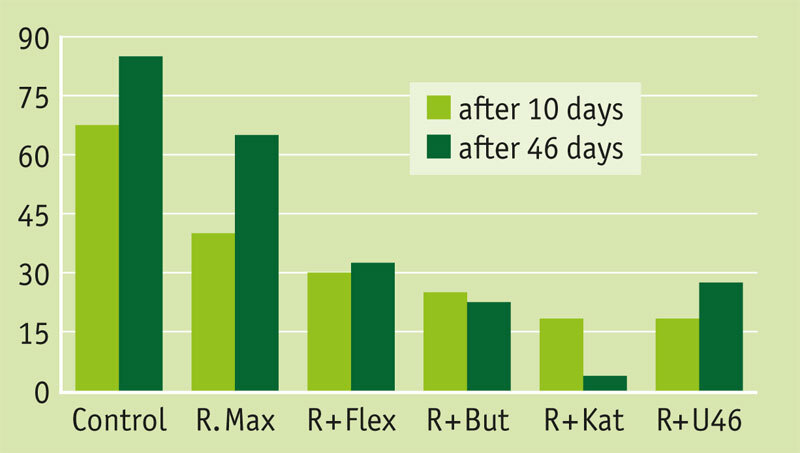 This test showed that the renewed accrual of weeds was delayed through the mixing of soil-applied herbicides. The number of glyphosate treatments per year can thereby be reduced. A further test confirmed this finding in 2008. 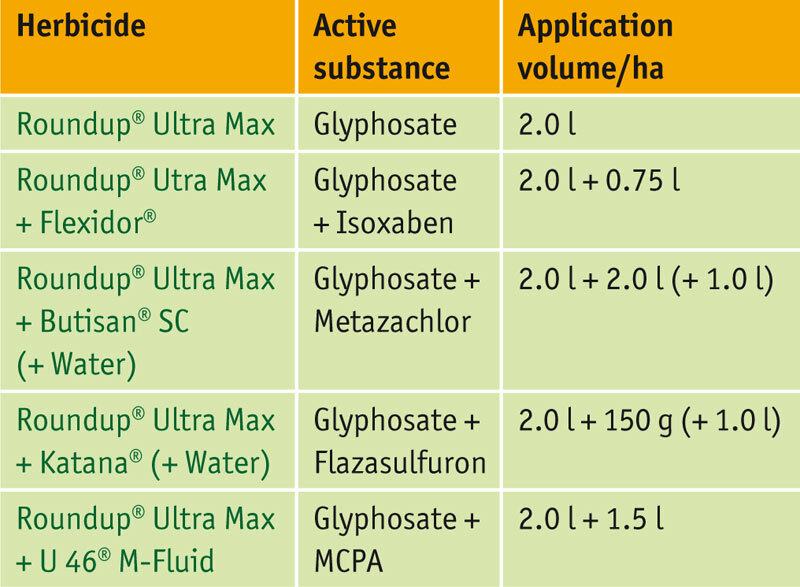 In addition, the combinations of glyphosate with Vorox® F (active substance: flumioxazin), as well as the three herbicides, glyphosate, Katana® and Vorox® F, were introduced, which likewise achieved a favourable long-lasting effect. The products were applied undiluted, as is normally the case, using the MANKAR-P 70 – 110 wheelbarrow-type unit. The variants with components in powder form were initially mixed with the equivalent of 1 litre of water per hectare, with the glyphosate being subsequently added. All mixtures could be applied by the unit without a problem. ULV technology can be deployed even in sensitive areas of cultivation, for which only a few herbicides are available. An example of this is the use of Basta® (glufosinate-ammonium 200g/l) with field-grown cucumbers. In a test by Bayer CropScience in 2008, the herbicide was applied undiluted with a MANKAR-P 50 in graduated application volumes of 1.5 to 4 l/ha in comparison with a conventional knapsack sprayer (AirMix 01, with a relatively low water quantity of 50 l/ha). Conclusion: no resulting damage to or spoilage of the cucumbers. 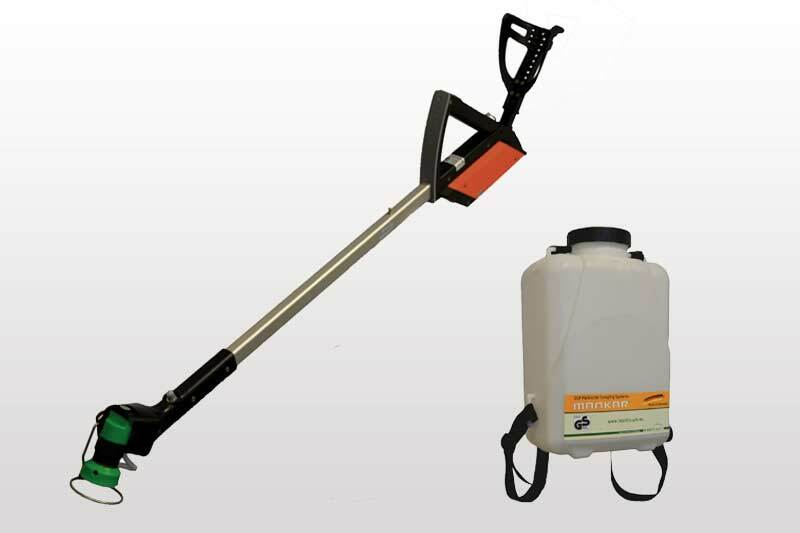 The effectiveness with MANKAR® ULV spray systems is comparable to the knapsack sprayer, whereby a minimum of 2 l/ha of Basta should be applied. Tests are being carried out with the MANKAR-HQ 80 using undiluted biological herbicides too with the active substance pelargonic acid, e.g. with Beloukha® (Jade International), which is permitted in France, and Finalsan® (Neudorff), which is permitted in Germany. Until the test results are published, you can find information about the current status under the heading Research & development. Metering settings for the most commonly used herbicide are specified in the unit's operating instructions. The desired flow rate for other substances or mixtures must be checked and re-calibrated as necessary. In this case, a test should always be carried out on a small area before treating the entire surface area. Immediately following application, the unit should be thoroughly cleaned. Any product used must be duly authorised for the relevant area of application. Country-specific regulations for herbicide use (e.g. obligation to obtain a permit) must be respected at all times. Please ask your plant care or weed control advisor fo rmore information.